I hadn’t realized it but we’ve been on this journey long enough that I have started to forget a little bit of what was lost. We were sitting in Nordstrom Cafe having lunch with my mom while we were in Arizona. They brought the food out and Claire looked at the macaroni and cheese like she had never seen food before, she was ready to eat. As if it were nothing, I told her how I remember the last time that we ate at this location with her, how she ate the macaroni and cheese at warp speed and then it dawned on me, she had eaten that meal independently. How had I forgotten this? Perhaps it is because we enjoy Claire for who she is today. She no longer screams every time her hands don’t do what she wants like she did in the months following the regression. As much as I want to love Claire for who she is now, who she was then is a part of that. After lunch wrapped up we headed to check into our hotel to prepare for the viewing that was later that night. As I scrambled to make sense of the mess of bags I put Claire in front of her talker as I had promised I would do. 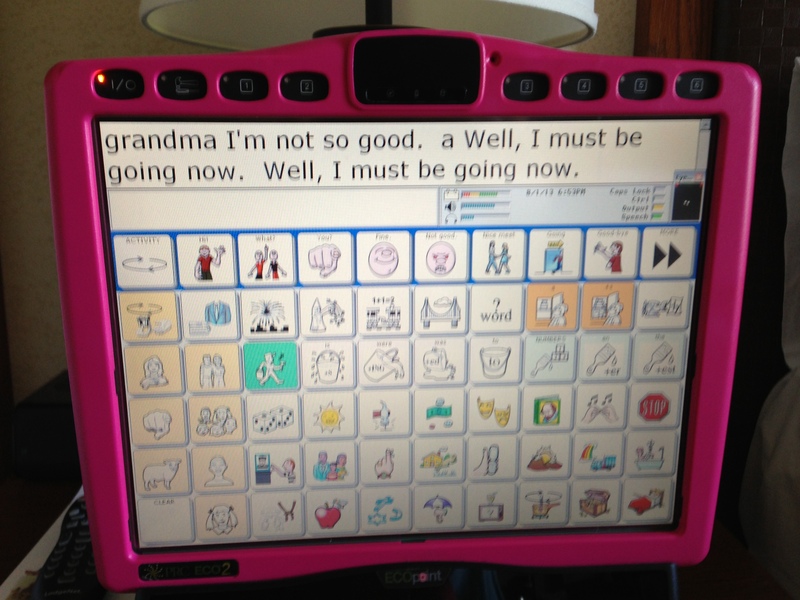 As I heard her voice I immediately stopped, she was talking about her Grandma (which is no small feat, the icon for that is a few pages deep, that this was the first word she said is huge!) She looked at me with a few tears in her eyes as I reread what she had said. She missed her Grandma, we cried together but quickly Chloe’s antics had us laughing. These simple things reminded me just how much Rett Syndrome wreaks havoc on our little girl’s brain, it is a monster, a villain of epic proportion. Still Claire is a greater hero. Fighting for life, to laugh with her sister, to cry when she’s sad and to tell the world so much more than anyone ever imagined. In the spirit of Claire, my epic hero, I’ve started this new site, a place to share our stories of our adventures in rettland. I am glad that you are here and hope that you enjoy the journey. So good to hear about Claire’s progress. I look forward to hearing more about the things she has to say. Good luck! Love reading this. Laura has had her ECO2 for almost two years and still is still asking for so many things to by put on it so we can talk. I love her initiative and determination! Thanks for a heart warming read. Susie, their determination is amazing isn’t it! I’m glad you enjoyed the story. Epic! one of my favorite posts. Claire is our hero too. Claire is a hero to many. So are you, my friend.